The Breast Imaging Center is located in the Main Hospital. Learn more about the role of a radiologist in this educational health podcast. CT generates detailed images of an organ by using an X-ray beam to take images of many thin slices of that organ and joining them together to produce a single image. The source of the X-ray beam circles around the patient and the X-rays that pass through the body are detected by an array of sensors. Information from the sensors is computer-processed and displayed as an image on a video screen. Corona Regional Medical Center is accredited by the American College of Radiology (ACR) in CT and uses new and advanced CT technology and equipment. MRI uses radio waves and a strong magnetic field to create clear, detailed images of internal organs and tissues. Since X-rays are not used, no radiation exposure is involved. Instead, radio waves are directed at the body. Many studies will require a small intravenous injection of a contrast agent. 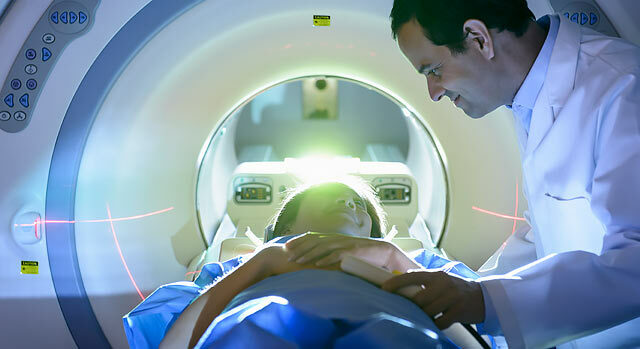 MRI is often used to evaluate tumors and diseases of the heart, liver and bowel. Breast MRI is also available. Corona Regional Medical Center is an ACR-accredited MRI facility and uses new and advanced MRI technology and equipment. During an ultrasound, high frequency sound waves are used to see inside the body. A transducer, a device that acts like a microphone and speaker, is placed in contact with the body using a special gel that helps transmit the sound. As the sound waves pass through the body, echoes are produced and bounce back to the transducer. By reading the echoes, the ultrasound can produce images that illustrate the location of a structure or abnormality, as well as provide information about its composition. Ultrasound is a painless way to examine the heart, liver, pancreas, spleen, blood vessels, breast, kidney or gallbladder, and is a crucial tool for obstetrics. Corona Regional Medical Center is an ACR-accredited ultrasound facility. An X-ray image is produced when a small amount of radiation passes through the body to create an image on sensitive digital plates on the other side of the body. The ability of X-rays to penetrate tissues and bones depends on the tissue composition and mass; the difference between these two elements creates the image. Contrast agents, such as barium, may be swallowed to outline the esophagus, stomach and intestines to help provide better images of an organ. To make an appointment with the Diagnostic Imaging Services Department, please call 951-736-6270.